Here are some more pics taken by the lovely Katie Bell for VOLUME 2 of A Pale Horse, Death And Hell Followed With ( A Lifetime Original Series). 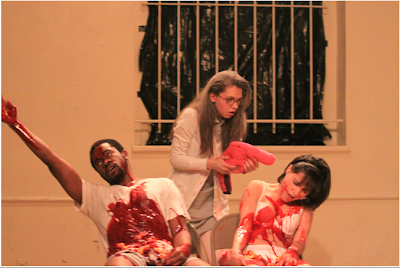 Don's miss our 3rd installment, HORROR going up this SATURDAY APRIL 18th at 10 p.m. at the Ontological Hysteric Incubator's at St. Marks Church ( Parish Hall). There will be beer! Astronome - only 7 nights left!! 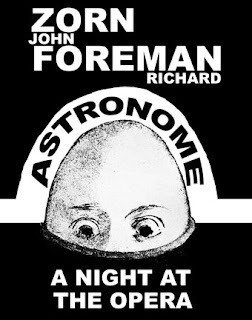 Astronome - Richard Foreman's rock opera composed by John Zorn, has only 7 nights left! I have been working in the illustrious position of box office manager and therefore have the inside intelligence that this show is a theatrical gem. According to my boyfriend, Alex Wessel, acclaimed literary critic and novelist, the highlights of the performance are Jamie Peterson's tongue, and Ben Forster getting spanked with a embossed ping pong paddle by none other than Deborah Wallace. The music is loud, and earplugs are passed out to wary audience members before entering the theatre. John Zorn's music will certainly rock you out of your seat. 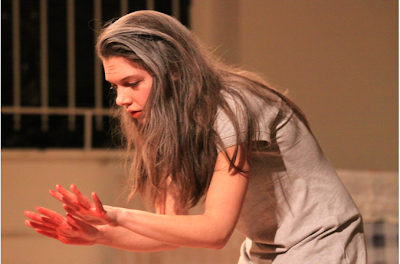 The performance is powerful and embodies all the best of sexual impulse, violence, and the occult. According to one Russian woman who spoke to me after leaving the performance, the play was "Pure evil." Aww Snap, Richard Foreman. 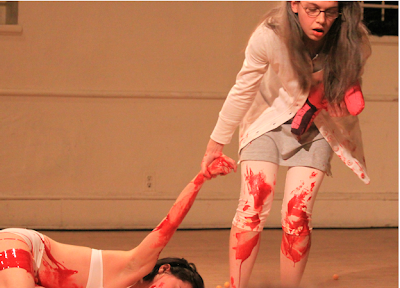 After ETG performed VOLUME 2: LOVE at the Ontological-Hysteric Theatre, I thought a great deal about pain and love. 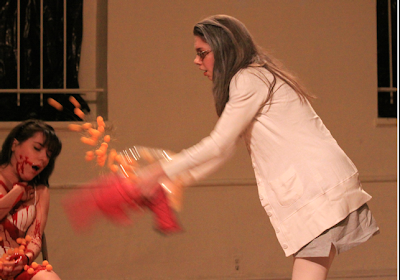 (For those of you who missed our fantastic short form piece, you can see it online here.) This led me to remember a short story I wrote about a man I loved who hurt me deeply. It was all about pain, but emotional pain. I think I should have known the relationship was going down hill when I started writing pieces about physical pain. Yet, I wouldn't give back any of those ache-filled days because they were also filled with so much love. It was a messy, awful love, but love all the same. Loving him changed me. To this day I am still not sure I'm okay with that. I think love also brings up issues of mortality. 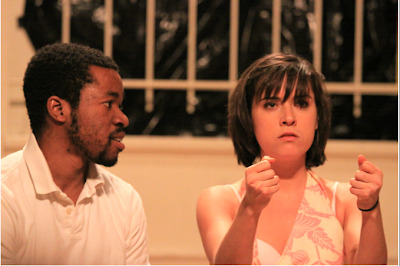 I find it fitting that so many plays, such as LOVE, or Shakespeare, or Sartre, merge love and death. When we are in the beginning stages of a really crazy, intense love, well, we sort of die, I think. We lose a part of ourselves. And that's scary. And there is so much fear in that love, because we worry about what happens to the other person if they die or, more selfishly, what happens to us when they "die" or leave us. Maybe love doesn't always hold up a clear mirror, but in the end it always makes us confront truths about ourselves we don't want to see. And that hurts like hell. Anyway, this wasn't just me shamelessly plugging some of my writing. I just wanted to share. Leah and I hang out at home. "I like to chew gum. I like space. I like my space. This is my basement. I live upstairs. Do you like my blue dress? I bought this dress after I graduated. It's from Anthropologie. Did I mention I like to jump? When I make shapes with the space I smile. Sometimes you just have to shake it off. There is time for it all. Time to jump and time to reflect." “Use it all. And Be Open.” This is what he told me. If you forget then you forget. If you remember then that's really something. It's simple. Right? Yes, yes it is." As ETG prepares to put on their second short form piece revolving around the theme of “love,” I can’t help but consider the other great artists that have attempted to capture that elusive theme. Language. For William Shakespeare it involved two young lovers foolishly killing themselves. For David Mamet it was just another dirty word. And for Noel Coward it was two adults arguing over martinis. 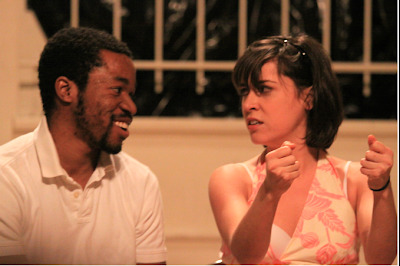 Regardless, in the minds of these playwrights love always involved unhappiness, both physical and emotional. Literary fiction does not fair much better, with greats such as Margaret Mitchell’s Gone With The Wind, Leo Tolstoy’s Anna Karenina or Boris Pasternak’s Doctor Zhivago always leaving lovers separated and unhappy. Music. Fiona Apple, Patsy Cline, Eliot Smith, Conor Oberst… all talented musicians who rarely choose to sing about puppies or world peace, but rather heartbreak. Yet love isn’t only pain. After all, there’s that glorious crush phase, where you walk by your love’s locker ten times a day in the hope of running into them. Then there is the puppy-love phase, where you and your newfound paramour want to be around one another 24/7 and hold hands until you give one another hives. Certainly, some artists choose to create based on those experiences, yet those creative ventures are outnumbered far more by pieces surrounding the negative aspects of romance and affection. If you can name me a happy opera involving love I can name you ten other tragic ones. What is it about romantic unhappiness that makes such fantastic art? And what do we do about it? Do we spurn all future romantic endeavors and live alone? Or do we go out again and again and embrace the possibly dashed hopes and future unhappiness, only to use those emotions in our next creative endeavor? I don’t have any answers. I just have these rambles. And one hell of a great heartbreak music mix.